the Northern Worker: Solidarity With the Workers of Iran! Solidarity With the Workers of Iran! 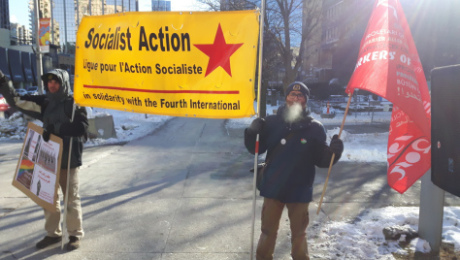 Despite the frigid temperatures and biting wind, there was a very good turn-out to the Solidarity with the Workers of Iran rally in Toronto on Saturday, Jan. 6. Socialist Action joined over 100 like-minded people rallying in support of the mass protests that have taken place across Iran since late December 2017. The protests began in the city of Mashhad and quickly spread across the county to many other cities, including Tehran. The protests have been organized from the ground up by working and oppressed people peacefully speaking out against poverty, unemployment, violence, and the daily indignities and injustices imposed by the Islamic Republic. Iran is a country with over 80 million people, yet despite immense natural resources and wealth, over 70 percent of the population live in poverty. * Corruption, huge concentrations of wealth by the few and vast inequalities define Iran today. At the time of writing, we are hearing reports of protesters being injured, killed, and arrested by Iranian security forces. Socialist Action stands in solidarity with the brave protesters and we express our disgust with the brutal neo-liberal capitalist regime of Iran. We also stand opposed to economic sanctions and any attempts by Canada, the U.S., and its allies to pursue war with Iran. Socialist Action also strongly opposes and condemns any interference by Western governments, Israel, and the reactionary, nationalist, and pro-monarchy forces. Socialist Action supports the workers’ demands of Bread, Jobs and Freedom and demands that Western imperialism keep out of Iran! *Varying estimates exist of the number of Iranians living in poverty. In the mainstream press, estimates generally cite figures in the 30% to 40% range (i.e., the Washington Post recently stated 35%, and the London Guardian 40%). Other sources give much higher estimates, while in 2014 the World Bank estimated that 10.5% of the population earned under $5.50 per day. Recently, poverty has soared due to various immediate causes, including government austerity measures (i.e., cuts in social subsidies), inflation, bank closures, unpaid wages, etc. >> The statement above was issued by Socialist Action/Canada.